Sophie’s Cosmic Cafe is a retro style diner located in Kitsilano. I have a big soft spot for simple, comforting, and greasy diner food, so anytime I pass by a diner I feel the need to try it. Sophie’s Cosmic Cafe has been on my list for a while and I was finally able to come check it out while I was working in Kitsilano. Sophie’s is frequently lined up, but I went on an early weekday afternoon and I was seated right away. 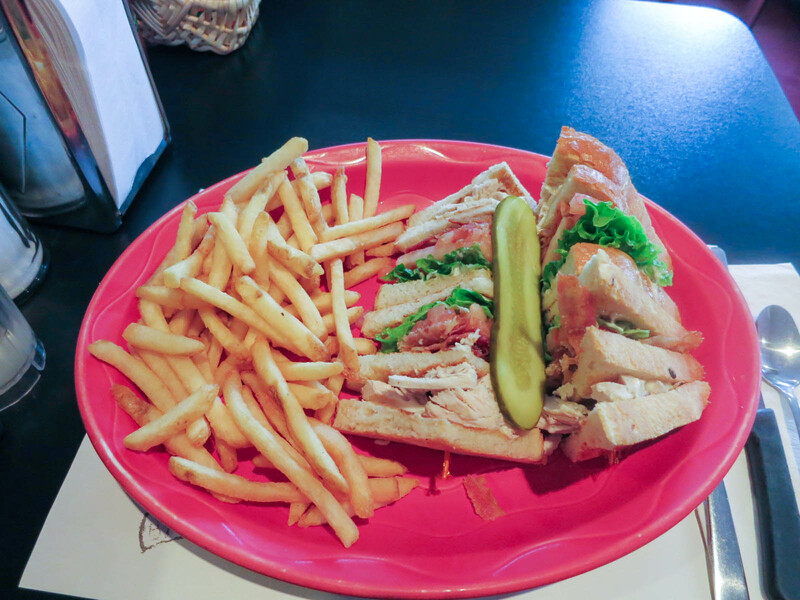 I ordered the Sophie’s club house ($12.99), one of my favourite classic diner meals. The sandwich was prepared with a triple layer of bread and filled with roasted turkey, bacon, lettuce, tomato, and mayo. I liked that they used big chunks of real roasted turkey for the sandwich instead of deli meat. Sadly, the other components of the sandwich were not as impressive. The bread was soggy and it seemed like it had been toasted and sat out for a while before it was served. The bacon made me sad. It was very thin and it lacked texture and smokey flavour. I really wanted to love Sophie’s, but I left feeling underwhelmed. The atmosphere is cute and eclectic, but the food wasn’t as good as I had hoped. I feel like you can find better value and tastier diner food out there. No, there are better diners out there. I am Anton, the retired now operator (still owner though) of Fraser Park Restaurant. One of my new hobbies now, with so much time on hand is checking out other dining places. I.like to meet with you and learn/exchange trade knowledge.